Why would I waste time calling someone out I didn’t vote for, stupid? Why even limit them? You just said you have zero fear of being harmed by one. Are you saying you are scared? Liberals (group you belong to) are so scared of guns if you own one that just LOOKS menacing they screamto have it taken away. That sounds like some phssy s hit to me. Dude, you're a leftist. There are no men and no balls among that population. no I am saying that I don't live a fear based life like some nitwit author encouraged some years back. it is the polar opposite of what all the great religions taught. I don't need the gumamint as a security blanket at l, but I recognize that many many people do. well Nancy has more balls than your orange crook or you clowns who are to timid to demand that he stops lying to your faces. have you no self respect that you allow and enable him to just treat you so shabbily? or maybe you like being treated like that. Nah. Nancy is probably more intelligent, but she's also a crook. Any career politician is. I personally dont like trump, but I agree with more of his policies than I disagree with. And now that your side is going way left, I'll vote for anyone other than those on the left whatsoever. A conservative child molester is better than any AOC or Pelosi any day of the week. Let's see some actual statistics on this. What needs to be compared are deaths caused by firearms in both countries, not the murder rate. Guns are only one way to murder people. The last thing we need to do is play follow the leader with Russia. Sorry you're so confused and so fearfully insane. The 2nd Amendment is not "sacred", and only gun-nuts imagine that it is something to "believe in". Nothing else in America's Constitution depends on the existence of the 2nd Amendment, no matter what retarded crackpot myths you gun fanatics are stupid enough to swallow. The "sacred 2nd" is an just an archaic bit of outdated, dysfunctional nonsense from the 1700s, when the world was a very different place, and it has no reasonable or functional place in our modern world. As studies of the comparative gun violence rates and crime rates in the other advanced, civilized countries with functioning law enforcement clearly show. We don't need an unlimited "right" to own any kind of gun. Other nations do just fine without this silly anachronism that results in more firearm murders, more mass shootings and more school shootings than all of the other modern nations combined. The United States, with less than 5 percent of the world’s population, has about 35–50 percent of the world’s civilian-owned guns, according to a report by the Switzerland-based Small Arms Survey. It ranks number one in firearms per capita. The United States also has the highest homicide-by-firearm rate among the world’s most developed nations. There have been at least 288 school shootings in the United States since January 1, 2009. That's 57 times as many shootings as the other six G7 countries combined. The 2nd Amendment should be, and probably will be, repealed. It never will be repealed you unAmerican asswipe…. You don't NEED to remain silent when you could just admit to what they ask you to. If you want to create a different government without inalienable rights, feel free. The U.S. needs to limit the number of guns per household, and the type of guns citizens are allowed to own. We also need to eliminate much of the hunting done in this country. This violence poisons society. To placate the bloodlust of these primitive types, we need to create some kind of 'kill off' diversion amongst themselves. This would benefit both groups, especially civilized man who has a far greater value. So do you really want civil war? That would accomplish the same goal: to rid our society of pests. By the time we decide to take your guns, your concept of 'fighting back' will no longer be taken seriously. this is why anti gun nuts cannot be trusted to tell the truth. Norway partically Oslo ( their capital) is known as the crime capital of scandinavia and sexual assaults is an all time high, they warn female tourist of the possible dangers. 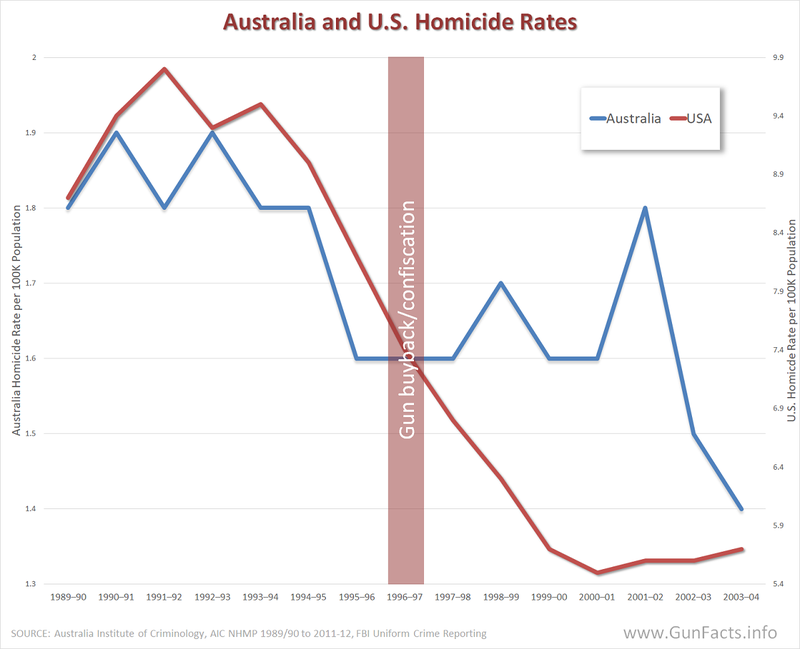 Gun deaths in the US decreased more than Australia, over the same time frame. Don't worry, we will. And it will be sooner than you think. Why would I dirty my hands on a cretin like you? I'll arrange for the mass disposal of the corpses. That would be much more fulfilling work. You're spending too much time in the woods, Gomer. You don't even know what's coming.